Lentil Flour (40%), Potato Starch, Corn Starch, Rapeseed Oil, Chilli & Lemon Seasoning (7%) (Rice Flour, Salt, Spices (paprika, cayenne pepper, black pepper), Chilli Blend (chilli, cumin, salt, garlic, oregano), Garlic Powder, Onion Powder, Yeast Extract Powder, Citric Acid, Dried Yeast, Natural Flavouring, Lemon Juice Powder (Maltodextrin, Lemon Juice), Colour (Paprika Extract)), Salt. From humble lentil to crunchy crispy chip the wonderful flavour of the lentil is infused with the touch of mild spiciness and the zesty taste of lemon. 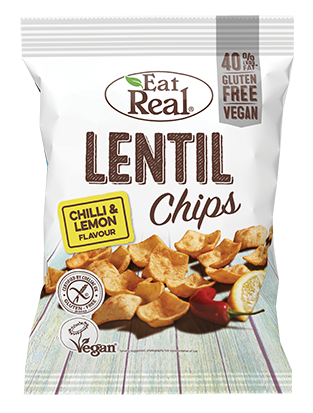 You’ll really enjoy the chip as the flavours offer a perfect balance between the fresh taste of lentil and unique blend of spicy peppers and tangy lemon! Perfect on their own or even better shared! With no added sugar (only the natural stuff) you're getting a healthy snack. Made from real, natural ingredients with no added nasties (artificial flavourings, colourings and preservatives), Eat Real have something for the whole family that can be enjoyed at any time of the day!